Drink: "Line up the virgins." Our protagonist, professor of genetics, Don Tillman is not good at dating. As a matter of fact, he hasn't ever made it to a second date. In general he is socially awkward, not tactful at all, prides himself on being completely rational and is mostly focused on scientific research. He only has two friends, optimistically he has a couple more, and has had a life long difficulty with being considered just plain odd. He lost any hope he had for finding a wife and having a family of his own, but when a sweet elderly woman informs him that he would make a "wonderful" husband his hopes are restored. He has done the research and he knows that statistically "married men are happier and live longer." Also, statistically, the odds are that there is someone for everyone in the world. So he gathers data and creates The Wife Project, which is basically a survey that he can use in order to rule out any unsatisfactory candidates for his future wife. Among the requirements he notes that his future wife must have he decides that she must be punctual, a non-smoker, a non-drinker, intelligent, a meat eater, and have an optimal Body Mass Index. His friends criticize him for being too specific and not willing to compromise, but he says that he is "collecting data to support life's most critical decision. Compromises would be totally inappropriate." Enter Rosie Jarman, who is the exact opposite of what Don is looking for. For the first time in his life, Don will act irrationally. 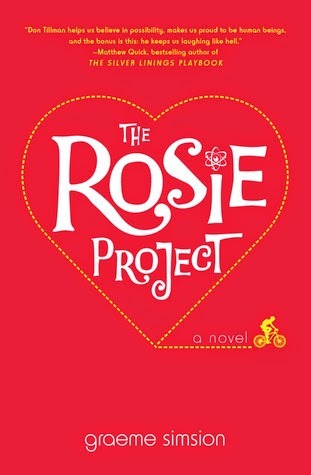 The Rosie Project is a brilliant work that is moving and hilarious. If you love romance then you need to add this book to your shelf. It was interesting, even mind-altering at times, to read from the perspective of an individual with such a severe "social variance." It made me reevaluate how I perceive the people around me, especially those who do not conform to certain social norms, "constructed social norms." All of the characters were well developed and I loved them all, despite and because of their glaring imperfections. In the face of overwhelming challenges and obstacles, all of them are able to grow and slowly figure out how to truly live and love. The plot had good pacing, there were a few times when I found myself skimming through inner-monologues, but for the most part I was engaged and interested in the content (even during mathematical and scientific details). Simsion has a way of making topics that seem drab come alive, especially through the character's voices. I look forward to his future work. There are many drinks that I would deem adequate for drinking while reading this book, most of them are drinks the characters themselves drank. However, I narrowed the scope down to "a virgin colada. Virgin Mary. Virgin--" well... just "line up the virgins." But don't let Rosie make them for you.